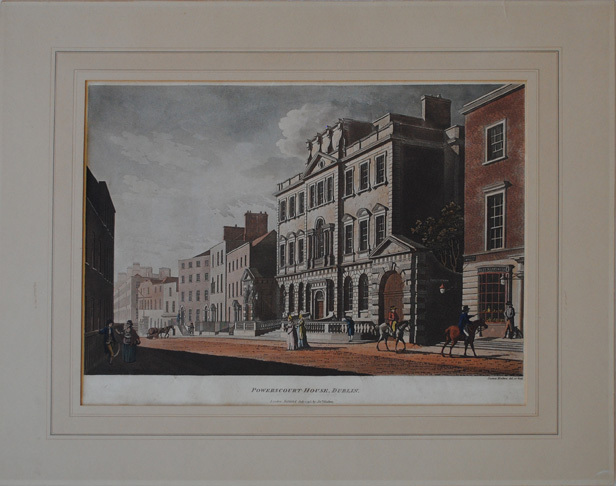 The engraver, watercolourist and draughtsman James Malton is best known for his ‘Picturesque and Descriptive View of the City of Dublin’ – an outstanding series of 25 aquatint engravings initially published between 1792 and 1799. Believed to have been born in London around 1760, he was the son of the architectural draughtsman Thomas Malton (1726-1801), and moved with his father to Dublin in 1785, where he worked as a draughtsman for the famous architect James Gandon who designed the Customs House (1781-91), the Four Courts (1786-95) and the King’s Inns (1795-1815). His tenure with Gandon was not a happy one, and Malton duly left to pursue his art. In 1790 he exhibited two topographical landscapes at the Society of Artists in London, while at the same time working on his Dublin views. For each view, he produced a large-scale watercolour painting followed by a drawing which was then printed using the etching and aquatint method which gives the work the look of a watercolour.